In the month of February many will be in the mood of Valentine's day and among them some will also be planning a travel to romantic destinations. In between there will be some folks who want to escape this love fever and just enjoy by themselves. Here are some places to travel in India for solo trips and for those who're single! India has varieties of destinations for travel and some of are exclusively for adventure travellers. This list of places are ideal for adventure as well as unique trips. Auroville is exclusively designed for people to experience a unique way of life. People come here from different parts of the world. Stay in Auroville for sometime and rediscover yourself while enjoying the beautiful surroundings. Camel Safaris are one of the unique adventures. 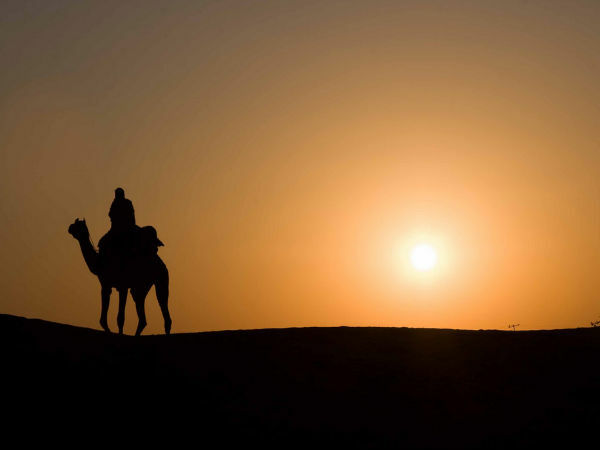 A camel ride around the Thar Desert is one of the exciting travel ideas. The places like Jodhpur, Jaisalmer and Bikaner in Rajasthan are known for desert safaris. Jump on a camel back and get introduced to the vibrant rural life of Rajasthan. The desert mountain valley of Spiti is known for old monasteries and a rustic ambiance. This year-round destination is ideal for enjoying a solo time. Travel the valley on foot and explore the surreal beauty of the Himalayan landscapes of this region. The ever green and ever busy Coorg also has many unexplored spots. These destinations are no less beautiful than the popular ones. So, start exploring the lesser known trails and you'll be amazed with the nature's gifts to this region. Tawang is a fast emerging destination in North-East India. Its surroundings are still pristine and less crowded. Trekking in Tawang is not an easy task as the mountainous trails are steep and risky. The scenic backdrop of mountains and nature in Tawang is a surreal beauty. Explore and cover all the places here. Goa is known as one of the best romantic destinations but it is also ideal for solo travel in India. Forget about the famous beaches and go around the lesser known beaches of Goa. These destinations are pristine and allows you to enjoy yourself. Just apt for a travel in India when you're single! Make an offbeat travel to Kasauli in Himachal Pradesh and enjoy the picturesque vistas of nature. The hill regions of Kasauli are one of the best places for camping in the woods.Just put a tent and spend some quality time with nature! Also enjoy the wildlife and don't forget the train ride. The famous monsoon destination of Maharashtra is also a land of heritage sites. There are a number of cave temples, forts and other historical places here. Plan a tour around the famous cave temples or a trek in one of the famous forts. These travel ideas are worth a try in this state!